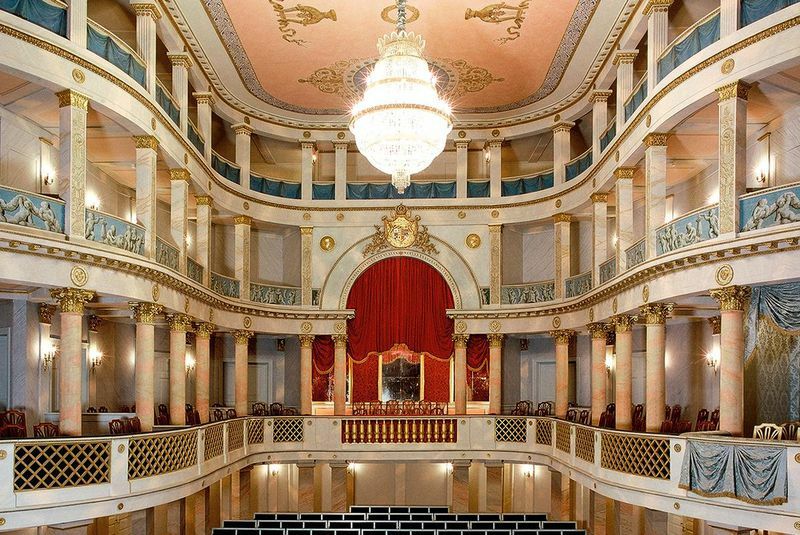 The Neapolitan composer Niccolo Jommelli's opera Il Vologeso was premiered in 1766 at Schloss Ludwigsburg, the residence of the Duke of Württemberg where Jommelli worked for the last 20 years of his life. Jommelli's operas prefigure some of the reforms introduced by Gluck and the recitative and aria from Il Vologeso sung by Benjamin Hulett, De' miei desiri ormai... Che faro provided a fine example of the way Jommelli was trying to make the music reflect the characters' state of mind, rather than be a show vehicle for the singers. The opening of the accompanied recitative had a striking texture and omitted the bass instruments, and Jommelli used this to punctuate the soloists almost unaccompanied outbursts. The aria started with a disjointed vocal line as the character was full of distracted thoughts, and the melodic phrases were completed by the orchestra. This was a device which Jommelli returned to during the aria. Benjamin Hulett sang with a lovely virile tone with a nice ease to his voice and firmness of line. In 1766, after an enforced stay in the Hague due to illness, Mozart wrote some music for the festivities associated with the coming of age of Prince William. Soprano Louise Alder joined Ian Page and Classical Opera to sing a pair of concert arias, Per pieta, bell' ildo mio, K.78 and O temerario Arbace... Per quel paterno amplesso, K.79. The first plunged straight in without an orchestra introduction, and with its fluid vocal line and richly textured accompaniment we had to admit that this really did sound like Mozart. The second aria was rather showier, giving Louise Alder the chance to display some fine passagework. In both she sang with a vibrant tone and a shapely feel to the line. The first half finished with the Symphony in G minor (g2) by Johann Baptist Vanhal. Vanhal was a Bohemian composer who was based mainly in Vienna and wrote a considerable amount of music which was popular in his day, though his career was beset by mental illness problems. This being a symphony written for Vienna there were four movements rather than three. The Allegro moderato opened hushed and anxious based on a rather striking chromatic figure. The Andante featured a charming oboe tune accompanied by a mixture of arco and pizzicato, but for me the movement seemed to have one too many repeats in it. The minuet and trio, paired stormy minor key minuet with a perky characterful trio. The Allegro finale started quiet, yet full of nervous energy and continued alternating loud and soft in a manner which hinted at Sturm und drang. The symphony revealed a distinctive and somewhat quirky character, and Vanhal's music seems to warrant more exploration. After a number of tribulations, Haydn was finally confirmed as Kapellmeister to Prince Anton Esterhazy in 1766 and he wrote his massive Missa Cellensis in honorem Beatissime Virginis Mariae in celebration. Benjamin Hulett sang the Et incarnatus est movement. This started with a lyrically intense arioso accompanied by throbbing strings, though the voice was often left completely unaccompanied with the strings punctuating the line. Then a beautifully moving aria sung by Hulett with a sense of shape to the phrases and a lovely easy flow. Pietro Alessandro Guglielmi was a name new to me, he was born near Genoa but trained in Naples. His opera Lo spirito di contradizione was written for the Teatro San Moise in Venice in 1766. Louise Alder sang the countess's final aria from the opera, which showed again another composer trying to reflect a character's distracted emotions in the music. Guglielmi's music was more conventional than Jommelli's with an element of bravura show in the second part of the aria, but the theatres in Venice were commercial after all and the operas had to be popular. We started with a dramatic accompagnato followed by an aria accompanied by a mixture of arco and pizzicato, where the vocal line started with disjoint phrases before a vibrant faster section, with Guglielmi alternating to two. 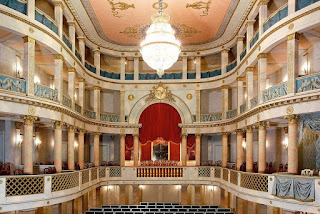 Franz Ignaz Beck was born in Mannheim where the young composer was seemingly being groomed for a position in the Electoral court orchestra (which was very famous in its day). But for reasons which are obscure but may involve a duel, Beck fled and led a somewhat itinerant existence based in France, ending up in Bordeaux as music director of the Grand Theatre. His Symphony in D major, Op.4 No.1 was premiered in 1766 and yet, four years before Beethoven's birth, Beck seemed to be looking towards Beethoven in his symphony. Ian Page and Classical Opera played just the first movement, but this was enough to show us how the sense of drama and strenuous vigour in Beck's music prefigured Beethoven. Not for Beck the casual elegance of most of his contemporaries, his music was robust, full of quirky details and dramatic contrasts. JC Bach was based in London (where Mozart had met him in 1765), and from 1766 we heard one of Bach's arias written for the Vauxhall Pleasure Gardens, Ah, why shou'd love with tyrant sway sung by Louise Alder with charm and poise, bringing out the piece's lyrical simplicity. When Mozart and his family returned to Salzburg from their travels, he wrote a Licenza (a musical act of homage) for his patron the Archbishop. This was a concert aria Or che il dover... Tali e contanti sono which was sung by Benjamin Hulett. Starting with a long, rather noble accompagnato enlivened by some perky details, the work developed into a vigorous aria sung with wonderful virile tone by Hulett. Mozart introduced some lovely imaginative touches into the work and I found it rather striking. Finally we heard Mozart's Symphony in G major, K.45a 'Old Lambach' a work which has gone through some vicissitudes being firstly assigned to 1769, then to Mozart's father before manuscripts came to light in the 1980's which confirmed the symphony as by Mozart and written for the Hague in 1766. Again in three movements, it opened with a vigorous, strenuous Allegro maestoso with the melody line in the bass a lot of the time. The Andante combined horn with muted strings in a graceful violin melody, and the final Molto allegro was full of gusto with quirky details. Ian Page introduced much of the programme from the platform, and for this last symphony he read out Leopold Mozart's scathing description of the orchestra for his son's performance of the symphony in Dijon which made us glad that modern day authenticity only goes so far. The celebrations of 1766 continue in April when Ian Page and Classical Opera will be giving a complete performance of Jommelli's Il Vologeso at the Cadogan Hall on 28 April..